A Hail Mary pass by the Seahawks is intercepted in the end zone by a Packers player; one referee says touchdown; the other calls it an interception. After replay, the ruling is a touchdown, game over. Seahawks win. The National Football League has been playing games with replacement referees since the beginning of the 2012-13 season, due to a contract dispute with the real NFL officials. The replacements have received mixed reviews since the pre-season. 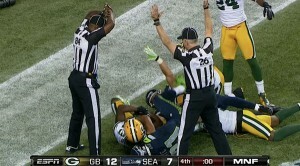 The ending of the Green Bay- Seattle game sealed the deal for most. The NFL had a huge credibility issue. Imagine for a moment that this was a client of yours. Your brand is pretty Teflon, but you’ve been using less than effective social media managers or ineffective PR-related services. You have a huge product launch. The release doesn’t get out and your social manager posts the wrong information. You face a ton of criticism from the client and the media. That’s pretty much a failure. And that’s what the NFL did. They used referees that were not really qualified to work NFL games. The game product has received criticism from fans, players and analysts alike. When it comes to PR and social media marketing, it is absolutely necessary to bring your best to the table. We stake our credibility as professionals to doing pitching, posting, and blogging the right way. You would just let any person post a blog for you because your credibility as a blogger and professional would be questioned. The bottom line is this: Never take a short cut, even if you think you can get by. The NFL thought they could get by without any big issues. The Monday night game ultimately cost the league a ton in credibility. Will fans still watch? Absolutely. BUT, the league showed they would cut corners to just keep things moving. As PR pros, we can’t cut corners because it WILL come back to hurt us in the long run. It will cost us clients, business, and ultimately, our jobs.